Roy Nissany completed back-to-back Formula V8 3.5 wins thanks to a dominant showing in Sunday’s second race at Silverstone. The Israeli followed up a breakthrough maiden victory in the series on Saturday with a second win, propelling him into second position in the drivers’ standings. 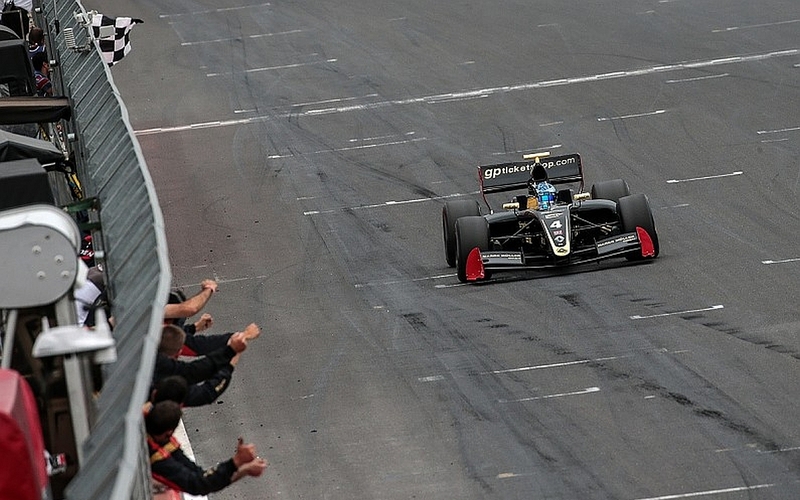 From the outside of the front row, the Lotus racer immediately got by polesitter Matthieu Vaxiviere, who power-slid away from the grid, to lead into Copse on the opening lap. Thereafter, Nissany demonstrated markedly superior speed to extend a 17-second margin over his second-placed team-mate Rene Binder at the chequered flag. “Since Friday we’ve had great pace, and we’ve been able to deliver this on track over the weekend,” said Nissany. The black and gold Lotus stable-mates had run in formation at the front of the field from the opening lap, as the fast-starting Binder slotted into second from fourth on the grid. The Czech-based Charouz operation that fields the Lotus drivers brought Binder in for his mandatory pit stop on lap eight, before Nissany came in for fresh Michelins on the following tour, pulling away from his team-mate thereafter. Egor Orudzhev completed the podium for Arden Motorsport with a lonely run to third – the Russian’s race only enlivened by a tough scrap with Vaxiviere on the first lap. The pair ran through the Maggotts/Becketts sequence in close proximity, before Orudzhev succeeded in grabbing third position with a bold manoeuvre around the outside of the SMP Racing man at Stowe. Vaxiviere endured a frustrating afternoon, losing positions in quick succession to Aurelien Panis at Vale on the second lap and then Fortec’s Pietro Fittipaldi. A track limits penalty dropped Panis from fourth on the road at the finish to fifth place, behind Dillmann. Panis was awarded the censure from race officials for track limits violations during a battle with Vaxiviere. Frenchman Vaxiviere finished the race in seventh, losing further positions late on after running off the road having breifly passed Dillmann for fifth. Louis Deletraz instead finished sixth, after team-mate Fittipaldi retired.